On Nov. 2, 2017, Kidde announced a recall of almost 38 million fire extinguishers sold in the United States. They may not work during a fire emergency if they become clogged and require a lot of force to use. Also, the nozzle can come off with enough force to strike and hurt someone. Kidde recommends owners immediately replace these fire extinguishers. The company is aware of one death when emergency responders couldn’t get the recalled extinguishers to work. 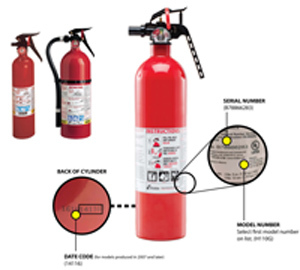 There have been almost 400 reports of problems related to these Kidde fire extinguishers. Check the U.S. Consumer Product Safety Commission’s website for information on specific model numbers involved with this recall. Kidde will replace recalled extinguishers for free. Remedy: Consumers should immediately contact Kidde to request a free replacement fire extinguisher and for instructions on returning the recalled unit, as it may not work properly in a fire emergency. Incidents/Injuries: The firm is aware of a 2014 death involving a car fire following a crash. Emergency responders could not get the recalled Kidde fire extinguishers to work. There have been approximately 391 reports of failed or limited activation or nozzle detachment, including the fatality, approximately 16 injuries, including smoke inhalation and minor burns, and approximately 91 reports of property damage. Sold At: Menards, Montgomery Ward, Sears, The Home Depot, Walmart and other department, home and hardware stores nationwide, and online at Amazon.com, ShopKidde.com and other online retailers for between $12 and $50 and for about $200 for model XL 5MR. These fire extinguishers were also sold with commercial trucks, recreational vehicles, personal watercraft and boats.